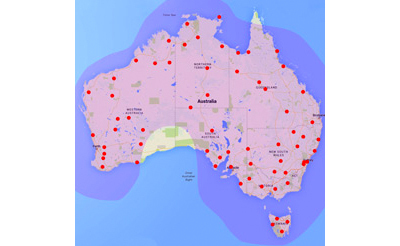 Weatherzone owns and operates the Weatherzone Total Lightning Detection Network (WZTLN), one of the most advanced networks of its kind in the world. Vastly superior to handheld and single site sensors, it provides high precision and accurate lightning detection using the very latest time of arrival technology (similar to GPS). The network has been constructed in Australia to meet the needs of our clients and is the only network available that can provide Total Lightning, patented Dangerous Thunderstorm Alerts and PulseRad. The Total Lightning capability of the network means that unlike other systems, the WZTLN captures ALL lightning, giving you earlier warnings of thunderstorms and better visibility and situational awareness. The WZTLN represents a new and ground breaking lightning detection capability for Australian businesses and combined with unique alerting capabilities means you will never be in the dark. Use WZTLN’s greater warning lead time to secure people and equipment. Minimise risk of death and injury from lightning strikes. Research shows that the flash rate of in-cloud (IC) lightning is a direct measure of storm intensity and the likelihood of associated ground strikes. Weatherzone Total Lightning Network is the first lightning detection network to comprehensively record both in-cloud (IC) and cloud-to-ground (CG) lightning which is critical for confidently managing operations around dangerous storm phenomena. WZTLN significantly improves severe weather warning times over radar and other technologies by incorporating highly advanced predictive capabilities, improving severe storm warning lead times and comprehensive weather management planning. PulseRad is a radar alternative based on total lightning detection providing continuous proxy radar coverage updated every minute for regions not covered by radar. It enables advanced warning and nowcasting of building storms, ensuring accurate alerting with increased lead times. DTAs provide 50% greater lead time on average, than other alerts. These severe weather alerts are issued when our Total Lightning Network detects high rates of lightning and potentially dangerous conditions. WZTLN is a business partner of Earth Networks making it part of a global lightning network with more than 800 sensors in over 40 countries. Most accurate cloud-to-cloud and cloud-to-ground lightning detection, providing improved lead times for identification of storm cell growth. WZTLN sensors have an industry-leading broad frequency range extending from 1 Hz to 12 MHz that detects both in-cloud and cloud-to-ground lightning. Over the last 6 months Weatherzone has almost doubled the number of sensors installed in Australia providing unparalleled network coverage. WZTLN achieves less than 1% false positives by employing time-of-arrival detection methodology along with GPS technology and sophisticated algorithms.